The detained head of Latvia’s central bank, Ilmars Rimsevics, is suspected of seeking a bribe of at least €100,000 (£88,610; $124,128), Latvia’s anti-corruption agency (KNAB) says. 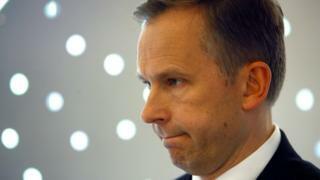 The Bank of Latvia governor was arrested on Saturday and his home and offices were searched. A businessman, Maris Martinsons, was also detained but later released. The Bank of Latvia says it has a “zero tolerance” policy regarding corruption and was cooperating with investigators. KNAB says the criminal investigation is not related to recent concerns about two other Latvian banks. The US Treasury has accused Latvia’s ABLV Bank of money-laundering, a move it linked to move against ABLV to wider action aimed at thwarting North Korea’s weapons programme. Norvik Banka is meanwhile in dispute with the Latvian authorities over alleged unfair regulation. Mr Rimsevics was first appointed Bank of Latvia governor in 2001 and is now nearing the end of his third term. He is also a member of the ECB governing council. Latvia’s Prime Minister, Maris Kucinskis, chaired an emergency cabinet meeting on Monday. Earlier he said the Rimsevics case did not pose any national threat. On Sunday, Bank of Latvia said it its operations were unaffected by the investigation. We want to reiterate that the performance of tasks entrusted to Latvijas Banka is not affected, and tomorrow the national central bank will resume its activities in the usual routine. This also means that all usual services will be provided to businesses and the general public.